The most anticipated new release of the day is the teaser of director Shankar’s 2.0, starring Rajinikanth, Akshay Kumar and Amy Jackson. The teaser was not only released online in Tamil, Telugu and Hindi, but also premiered in thousands of screens across India in 2D as well as 3D formats. 2.0 has been long in the making, its release having been postponed multiple times owing to the immense scale of the VFX work involved. The teaser is definitely quite eye-catching in terms of its visuals and Shankar’s imagination. It is packed with many ‘blink and you miss it’ moments and is worth many pauses, rewinds, forwards and repeat viewings. It depicts how mobile phones disappear from the grasp of their owners and from showrooms, and are being used by an evil force to wreak havoc on human civilization. While the energy from cellular networks is channeled, people are left alienated without their phones. From what we know, Akshay Kumar plays the antagonist, Dr. Richard, who personifies a crow, an evil bird. When all hell breaks loose, Chitti the disassembled robot (played by Rajinikanth) is brought back into the picture by its creator Dr. Vaseegaran (Rajinikanth) to bring the situation under control. We also see glimpses of Amy Jackson, Sudhanshu Pandey and Adil Hussain in supporting roles. As in the first part Enthiran (2010), the teaser of 2.0 also features spectacular, jaw-dropping formations (with thousands of mobile phones and Chittis) created through VFX. We may well see multiple versions of Chitti here too. The song ‘Rajaali’ also hints at dwarf-sized robots. The highlights of the teaser include A.R. Rahman’s groovy “I got this, you got this” rap and the way it transitions into a grand orchestral score when the title card is flashed. If Enthiran had Superstar Rajinikanth deliver a crowd-pleasing “Mehhh” bleat, here he utilizes a wink and a “Hoo Hoo” hoot to thrill us. We also get a repeat of other classic Chitti moments, such as the way it skates coolly along the roads, how it transforms into a one-man shooting squad with hundreds of machine guns at its disposal and its trademark wicked laugh. The stage is set for a classic face-off between good and evil. 2.0 looks much more grand and ambitious than its predecessor. The ‘Showman of Indian Cinema’ Shankar has seemingly crafted a film which will be worth the long wait. This was what Kasi Theater, Chennai, looked like today morning when the teaser was screened during the interval of Seemaraja. 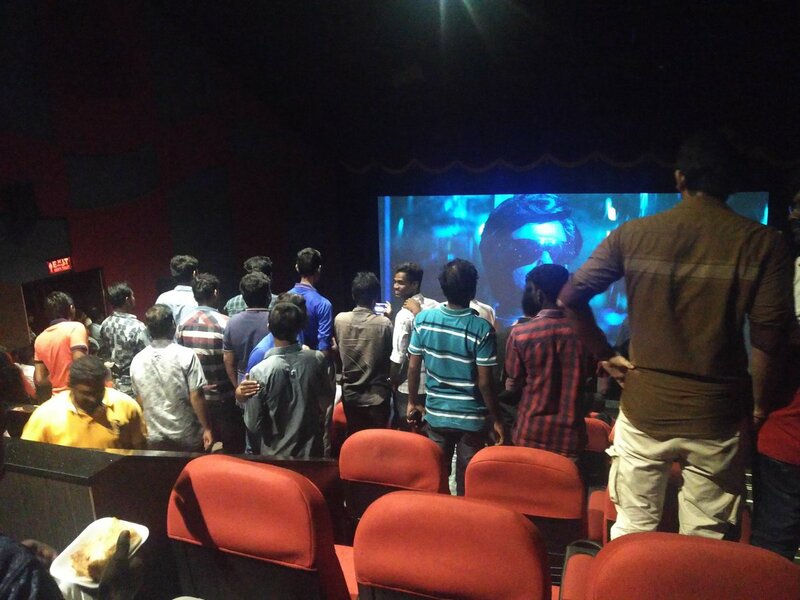 Reports suggest that the scene is similar in every theater where the teaser is being screened. The hype is real and it will only grow in the weeks leading to the grand release of the film on November 29. Next Next post: Did Karan Johar Just Confirm Deepika-Ranveer’s November Wedding?